One of the worst things that happen as we get older is that our hearing power decreases. All of a sudden, we are not able to hear things that are happening across the room. We can’t hear when someone calls out our name and wants to get our attention. Or we can’t hear our name when it’s called at our local coffee shop. These are all big problems that may cause some serious frustrations if you are facing them. However, you shouldn’t fret! 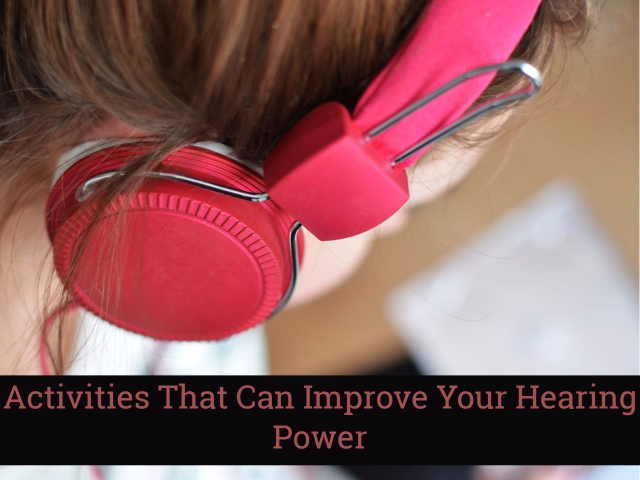 There are tons of ways that you can increase your hearing power. You just need to keep reading down below to learn more about those ways and how you can implement them into your daily life. Did you know that your brain power is directly connected with your hearing power? That’s why once you get older, your hearing power gets worse and worse. Most of the time, it relates to the health of the nerve endings in your brain and how quickly they process information. When you get older, your brain can’t process information as quickly and that creates problems with your hearing. One of the best ways to improve your brain power is to just exercise it more with some great brain games! You can try out crossword puzzles and Sudoku if you want. Did you know that yoga can actually help to improve your hearing? A lot of the times, hearing problems come hand in hand with more stressful situations in life. When you are feeling a ton of stress and anxiety, then you are more likely to experience hearing problems. When we do yoga, we are going to feel that stress melt away as you go through various poses and become one with yourself. Try it out and see what you think about this ancient practice! Another great way to improve that ear health of yours is to exercise. You don’t need any hearing aids! If you don’t exercise on a regular basis, then you are putting yourself at higher risk of getting hearing problems as you age. You can either go exercise at the gym or do some various exercises outside on your own. Or you can even just take some runs around the neighborhood or brisk walks around the public park! When you think about decreasing your stress levels, don’t just think that yoga is the only option for you! There are tons of ways that you can get rid of stress that can lead to higher hearing loss in your future. All you need to do is download a meditation app and start meditating in your mornings or afternoons. Now, you might not have thought about meditating in the past, but it’s definitely a great way to center yourself, focus on the important things in life, and get your life together. And now you should know that it’s a great way to improve your hearing! You can easily do this activity to help out your hearing whenever you are going about your daily life. All you need to do is focus on certain sounds around you to sharpen your hearing. Focus on that sound, stop focusing on it, and then focus on another sound. Then, continue doing that for the various sounds around you. Your hearing muscles are just that – muscles. And when you work on them on a regular basis, then they can get better at doing their jobs. There you have it! Each of these points are super important to remember when you are trying to get rid of those hearing problems that you may be experiencing. Which are you going to try first?